Fiennes, who does not use Twitter, is not alone in his theory. JP Davidson, the author of Planet Word and a linguistic expert, talked this week about longer words dying out in favour of shortened text message-style terms. He said: “You only have to look on Twitter to see evidence of the fact that a lot of English words that are used say in Shakespeare’s plays or PG Wodehouse novels — both of them avid inventors of new words — are so little used that people don’t even know what they mean now. Since I'm the old-fashioned sort of person who clings to the belief that words, whatever their length, ought to mean something, I thought I'd check whether it's really true that "words are getting shortened" by the constraints of the Twitterverse. So I grabbed the text of Hamlet, the text of a number of P.G. Wodehouse stories (Leave it to Jeeves, Jeeves and the Unbidden Guest, Jeeves and the Hard-Boiled Egg, Absent Treatment, Helping Freddie, Rallying Round Old George, Doing Clarence a Bit of Good, and The Aunt and the Sluggard), and the 100 most recent tweets from the Daily Pennsylvanian, Penn's independent student newspaper. I figured that the DP ought to count as a good representative of the Kids Today who are responsible for the alleged word-shortening trend. I wrote a little program to adjust these texts in appropriate ways (removing the character attributions and stage directions from Hamlet, removing the Gutenberg boilerplate from P.G. Wodehouse, removing the @'s and #'s and URLs from the DP tweets, etc. ), and then to count the letters in each word. The result? The mean word length in Hamlet (in modern spelling) was 3.99 characters; in P. G. Wodehouse's Jeeves stories, the mean word length was 4.05 characters; in the DP's tweets, the mean word length was 4.80 characters. The business about word lengths is the easiest to check of the article's assertions about linguistic decay, and it's false. Trivially and transparently so, as such plaints usually are. I don't have the time this evening to train up language models to check the claim that "words … are even becoming redundant as a result", but I'm willing to wager a substantial sum that the DP's tweets have significantly higher average per-word entropy than the novels of P. G. Wodehouse. This would be logical, in fact, since "people trying to fit as much information in 140 characters" ought to lead to higher information density, and therefore less per-word redundancy. Dr. Davidson's argument on this point is so obviously inverted, from a logical point of view, that I'm inclined to wonder whether The Telegraph's reporter might have misquoted him. Similarly, I'm confident that the distribution of syllable-counts in the Twitterverse tends to be higher than in Wodehouse or Shakespeare, since the constraint on message lengths favors semi-telegraphic modes of expression. As for the notion that "the sentence with more than one clause is a problem for us", it's certainly true that average depth of embedding has trended downward since the 18th century (though not monotonically so). But Shakespeare and Wodehouse are not especially good examples of hypotaxis — I suspect that investigation would show that the DP's articles exhibit a somewhat higher average depth of clausal embedding than either of them. The Telegraph article also asserts that Mr. Fiennes's full name is Ralph Nathaniel Twisleton-Wykeham-Fiennes, which I consider implausible but too good to check. If this is true, in any case, it would certainly give him a personal interest in the matter at hand. Dr. Davidson has no such excuse, though a decade spent working for the BBC might be taken to constitute extenuating circumstances. You know what will never be flattened or truncated? An actor's ability to plug his next movie, which in this case would be a contemporary version of Shakespeare's Coriolanus, which Fiennes stars in and directed and is due in theaters this January. Don't get Ralph started on his sententious exegesis on establishmentarian perturbation! He'll gnaw your ear off for hours. I may be misinterpreting the box plots, but Hamlet has plenty of words longer than 8 letters, and Wodehouse used plenty of words longer than 9 letters. From the perspective of data visualization, it would probably have been better to use a bean plot or a violin plot… But I can add that the 95th percentile for both Hamlet and the Jeeves stories is 8 letters, whereas for the DP's tweets it's 10 letters. Dr. Davidson's argument on this point is so obviously inverted, from a logical point of view, that I'm inclined to wonder whether the Telegraph's reporter might have misquoted him. I took it to mean that words we consider necessary in 'natural language' are becoming redundant in twitter language and are therefore left out of tweets (Omit Needless Words!) to the annoyance of people who need everything spelt out (Avoid Ambiguity!). Seems to me that the tweets should be expected to have longer words on average, since they are more apt to leave out short words such as "the." 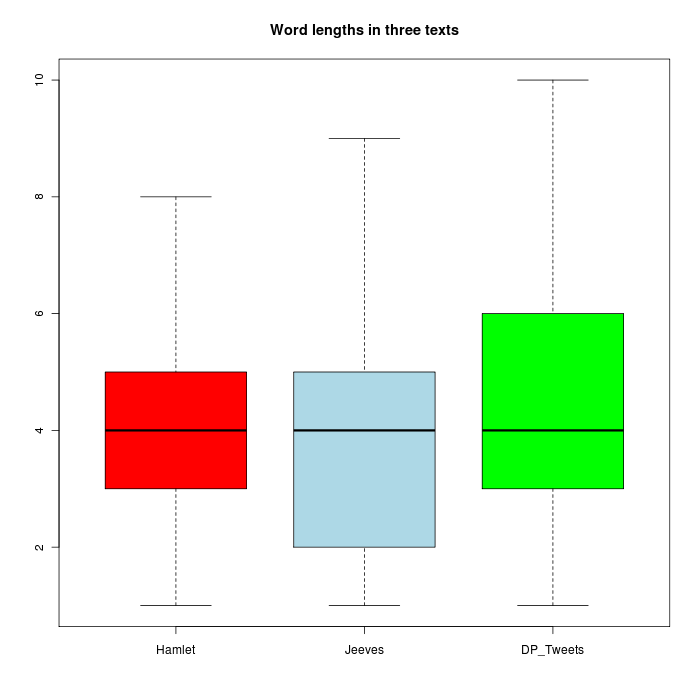 But you might also expect the content words to be shorter, giving less of a tail on that end of the graph, which is not actually seen in the data. Wikipedia confirms Fiennes' full name, so it's probably pure coincidence that one of Bertie Wooster's friends was called Pongo Twistleton-Twistleton. Teucer’s observation about words like “the” is a good one, I think For the record, I read teucer’s comment only after tweeting about this very blog post. Aside from including the LL link, I wrote, “Box plot of the day: Daily Pennsylvanian tweets contain longer words, on average, than Shakespeare, Wodehouse.” I think “The Daily Pennsylvanian’s” would have fit, though. Nice and old-fashioned of you to write "plaints" instead of "complaints". We don't shorten words that way so much any more. I wonder if "redundant" is being used in a peculiarly British way here. I know that it has a meaning in Britain this is basically "fired" (or "sacked"), although I assume there are some subtleties related to whether the vacated position will subsequently be filled by a new hire. Perhaps this use of "redundant" is influence by a figurative extension of that meaning? "Wikipedia confirms Fiennes' full name, so it's probably pure coincidence that one of Bertie Wooster's friends was called Pongo Twistleton-Twistleton." Or that once of his erstwhile fiancees was Bobbie Wickham. Rather a good bit of coincidence, there. what is ironic is his whine that we have lost some words used in shakespeare's time; obviously a great deal of extremely frequent modern words found in shakespeare are nothing but false friends. I don't believe that Pongo Twistleton has the extra "Twistleton". Not like, for example, Cyril Bassington-Bassington. In the same article, the erudite Mr. Fiennes used "begs the question" in the sense of "raises the question." Yes, yes, I know, that's how everyone uses it now. its descriptively coming to mean that, and it's no use having that as my pet peeve, but certainly it isn't something that a person complaining about erosion of standards, dilution of language, etc. would be expected to do. Who's law is it that states that a letter to the editor complaining about grammar, usage, or syntax will invariably contain at least one error of grammar, usage, or syntax? Were there similar (incorrect) complaints with the rise of telegrams? Obviously, this story will be tweeted by all and sundry — as it should. What I don't understand is why so many people equate brevity with stupidity. I mean it's been a while since I've had to write a formal essay, but I always understood that expressing yourself succinctly was as important a skill as using lots of long words. Though I don't tweet very often, I think the formal, haiku-like constraints are interesting. Surely the problem, if there is one, is not the average length of words in the Twitterverse, but the distortion of language and speech/conversation rhythms into impersonal sound bytes (though 'txt'-speak may be more of a culprit here). But I find it difficult to be alarmed about such things; any living language is bound to be relentlessly protean. A rebuttal should not be predicated on the assumption that a peever using a hard word like "redundant" or "patois" actually knows what it means. This wastes my LL subscription dollars. Sorry to go off-topic, but I want to amend that lazy last statement, as it suddenly occurred to me that of course there may well be living languages that are not 'relentlessly protean', and some, such as the Amazonian Pirahã, may hardly change at all. I agree with Ø about "plaints". Let's revive it. Modern kids with unnecessarily long words … get off my lawn! It's a shame that "serious" media such as the Telegraph give credence to actors' statements on linguistics, politics, etc. No one would think to publish a linguist's or politician's views on the finer points of Method acting. In any case, your experiment is fascinating but are you sure that tweets created in an Ivy League environment are a representative sample? [(myl) There's a listing of "Directors, Screenwriters and Actors on Twitter" here. The first one on the list is Judd Apatow. For his most recent 15 tweets, the mean word length in characters is 4.65. Oh Mr Fiennes, Twitter is the single biggest language resource I have yet discovered – full of word nerds, linguists, pedants and ponderers – and, yes, some naughty txtspeakers too. PS. Don't worry, this hasn't stopped me fancying you. It's possible that Mr Liberman was deliberately and cheekily skewing the figures, but you can make a very strong case that it was an attempt to pick a balanced sample. While neither Shakespeare nor Wodehouse had the benefit of a university education, they were both professional writers at the top of their fields, and if we are attempting to trace the effect of *twitter alone* on people's use of language, it is important that we compare like with like. Obviously a lot of tweets *are* written by people with poor literacy skills, but this does not mean that tweeting *causes* poor literacy, and I am *absolutely damned certain* that the average sixteen year old in 21st century London is *far* more literate than the average sixteen year old in Shakespeare's England. I wonder though whether some of the difference is accounted for by the proportion of proper nouns (especially names) in the text? I would expect that to be higher in tweets than in any work of literature. I imagine they tend to be longer than the most common English words. @teucer: Constraints like those put forth by twitter tend to influence people toward leaving out low-information words, and low-information words tend to be short. However, I don't think low information words compose a significant percentage of unique short words, and I suspect that the literary forms tend toward avoiding redundant use of low-information words anyhow. However, it's easy enough to run the experiment over again with text free of articles, or text free of the top 1% most common words. I have a sneaking suspicion that using tweets from a 'literate' source like a university newspaper would not be convincing to a supporter of the abovementioned argument, and were this experiment to be run over again I'd recommend using the public feed as a source, rather than the DP. This has a mean and median word-length of 2 and, isn't exactly content-free. Twitter really is one of those unfortunate kinds of observational sets of data that varies so widely given a dependent domain that no argument will convince anyone of what they are not already convinced of. Given twitter is social media, the tweets you tend to see are MORE THAN LIKELY clustered around socio-cultural-economic chunks. Extreme claims are better bounded by counter-extreme evidence. And don't forget about code-switching. Just 'cause you go to a good school doesn't mean you can't switch to Twitter-speak. Also, if there's an extreme claim about short words (and we assume "non-literates" use shorter words than "literates", who better to test the extreme claim against than those who you think might have a "larger" vocab… testing for data sets for which you expect to support the extreme claim is trivial). If college students confirm the extreme claim, then the likelihood that not-college-educated will confirm the claim is even higher. But really, it seems that many people are convinced that reading Shakespeare or Melville makes them a "better" person because they are reading all the big and interesting words. And the layperson on the facebooks and twitters will continue on in normal ignorance of Dante and Shakespeare (who, by the way, were part of pop culture in their day). Aheesh. Comparing creative writing and twitter (or email) may be comparing apples and oranges. I myself (at age 44) am a product of what we call the "business writing" method. Beginning in college, and continuing today in my workplace, I am encouraged to write sentences with fewer clauses. This aids easy readability and scanning, and communicates efficiently. Could it be that we really are writing shorter sentences, but that this is not the results of twitter? Rather, it may be the result of a cultural trend that values efficiency and clear communication more highly than creativity? [(myl) Average sentence lengths have been getting shorter, in many varieties of English prose, for several hundred years — see e.g. "Complexity", 9/7/2005. To the extent that it's not purely a matter of fashion, this is probably due to changes in the role of classical languages in education, changes in the audience due to increased literacy rates, and (more recently) with a general stylistic trend away from ornamentation. There is no comparable trend, as far as I'm aware, towards shortening of word lengths. Since telegrams were apparently typically paid for on a by-the-word basis rather than by-the-character basis, you might expect even more than with tweets to have longer average words with more short words that would be obligatory in ordinary prose omitted. Eg., here's Orville Wright's famous telegram to his father from December 1903: "Success four flights Thursday morning all against twenty one mile wind started from level with engine power alone average speed through air thirty one miles longest flight fifty nine seconds inform press home Christmas." I always associated PG Woodhouse with a rather high level of hypotaxis -particularly complex chains of parentheticals. But maybe my impression was wrong. Wonder what a thorough investigation would reveal. Actually, John, the mean word length is 3 (ten words; thirty letters). P(t | L,e) = P(L | t, e) * P(t | e) / P(L | e). where t = twitter-cause, L = language-degradation-effect (shorter words), and e = evidence. In order to prove that twitter causes some degradation in language you have to prove that there is in fact degradation in language. This means you need to compare common language today and common language from Elizabethan England, then compare Twitterverse with common language, and Shakespeare with Elizabethan common language. There is no corpus of spoken Elizabethan English, all we have is written text. Even if you had a spoken Elizabethan corpus to compare against Elizabethan written text, Twitter and social media are entirely new genre's of language. It is not comparable. Shakespeare's constraints were not bytecode related, but they were dictated by clarity in pronunciation. Twitter and Shakespeare are not comparable, but neither is Twitter with most historical textual material! This means Twitter's impact is unpredictable. We could build models for prediction but we won't know if they are right. I think it's this intuitive sense of the unpredictability of Twitter's (et.al.) effect on culture that creates fear, panic, and unfounded claims. Lastly, say we had good historical data (like scientists may have 100 years from now). 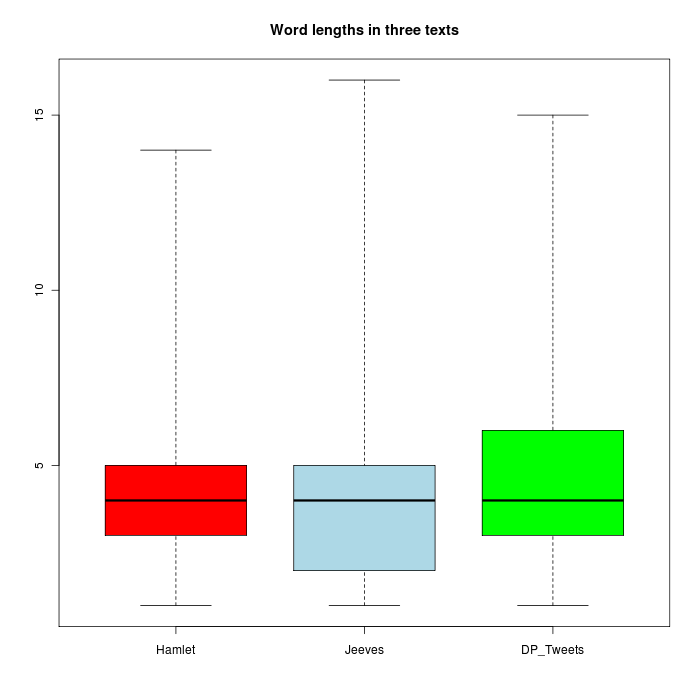 We would need some way to model average word length as a mean over all discourse genres for a really good sample set (i.e., diverse and large enough) for currently spoken and written language. We can't do this. So we use what is accessible and extrapolate from there: internet. But the internet is a special phenomenon (about 12 years old!!) with a crazy number of socio-cultural linguistic sub-genres. And this is where trained linguists come in handy, they already grapple with hard questions like linguistic relativity and the quality of information contained in phonetic and written characters. Linguists deal with hard problems like genres, and how language and culture relate and where the ability to use language comes from. For most people, the language-is-thought-is-culture fallacy goes un-investigated (or it's oversimplified) because people are running with their intuitions and circumstantial evidence. Anyone reading this blog is well aware of that. I have given up trying to explain this stuff to people at work. They see patterns in noise and no amount data removes the pattern they see; the problem is classifying a pattern as useful or not, and if the pattern reinforces some epistemic belief they have about reality and the world, then you can't convince them that they're personal belief is wrong. You just sum up the data and leave it at the doorstep of Karl Popper's house because you cannot falsify someone's belief in something, only their justification of it. Whether someone wants their beliefs to be justified is a matter of personal conviction: "The 'principle of causality' is the assertion that any event whatsoever can be causally explained — that it can be deductively [or probabilistically] predicted"
I wonder why Ralph Fiennes' first name is pronounced the way it is. It sounds like Ray or Rafe? Is that the usual pronunciation in Britain? Man, we've long since passed the point where people have no idea what the hell Shakespeare was talking about. I would need to see some hard evidence before I'd believe that the average Baby Boomer or Gen Xer knew what a petard or a bodkin was. The odd pronunciation of Ralph Fiennes name is an upper-class British thing; due to the accent, the "a" sound is more of an "ay", and the "l" is almost unspoken. Ordinary Brits pronounce Ralph "Ralf", where the "Ral" rhymes with the "Cal" in "California", just as many Americans would. Echoing eric's comment and Mark Liberman's reply, I am as puzzled by Ralph Fiennes's complaint about declining word and sentence length as by his attribution of responsibility to Twitter. As a native speaker of a Romance language, for many years I have been forcefully admonished by sundry teachers that English demands short words and short sentences, and that refusing to comply is at best a Latinism, and more likely (in my case) a clumsy Italianism. My high-school teacher used to tell us in so many words: "English prefers parataxis to hypotaxis." Going back to Victorian manuals—or are they really Edwardian?—the Fowlers' fourth rule is: "Prefer the short word to the long." (Fowler, H. W., and F. G. Fowler. 1906. The King's English. Oxford: Oxford University Press. P. 11). Both tenets are certainly impressed upon graduate students in economics in the U.S.—and by imitation the world over. A widely read usage guide (Cochrane, John H. 2005. "Writing Tips for Ph.D. Students." Mimeo, University of Chicago) instructs writers to "Use simple short words not big fancy words" (p. 7) and "Keep down the number of clauses in your sentences" (p. 8). Considering how difficult and at times painful it has proven for me to strive to adhere to such standards, I could not but appreciate if Mr. Fiennes were to lead a crusade in favor of Latinate polysyllabic words and subordinate-rich complex sentences. But shouldn't he address his complaints to the usage authorities preaching twofold brevity rather than to Twitter-using average writers? to hell with those examples. the meanings of so many words in shakespeare's works have changed yet people who manifestly do not and indeed can not without training understand what shakespeare meant can delude themselves to the point of publically making claims like the above writer's. i am now more skeptical of the entire notion of a literary canon and i suspect it actually deters reading by convincing average people that if they resolve to read more it should be some 'classic' novel of ungodly length, or a shakespeare play they then have to pretend to understand. @zellieh: I don't think it's "due to the accent"–no one pronounces "Alf" (to pick the closest rhyme I can think of) "Afe" or has a "ay" where everyone else has "a." It's just an older pronunciation of Ralph. Ralph Vaughan Williams' name is pronounced the same way. I believe, in fact, that that [rælf] is a spelling pronunciation. Here's a little disquisition on the "Rafe" pronunciation of Ralph, and why it is that way: http://users.ox.ac.uk/~mert1230/Pronunciation_of_Ralph.htm He invokes compensatory lengthening with the loss of /l/, followed by the Great Vowel Shift, but, as he notes, that doesn't explain why "half" isn't pronounced "hafe." One last bit, for those of you who are still unsure how to pronounce Ralph Fiennes name, I commend this valuable Youtube video to you. "What I don't understand is why so many people equate brevity with stupidity." My guess is they're confounding fluency with articulation, forgetting that algebraically speaking the truth is simple, with straight talk being the shortest distant to one's point. It's been said the power of language is best gauged not by what it can say to us, but by what you doesn't need to say. Oops, Muphry's law means I should've written "…they're confounding fluent with articulate" not what I wrote. I started reading your second post and thought, "Oh good, she caught it." It's been said the power of language is best gauged not by what it can say to us, but by what you doesn't need to say. I wasn't sure whether you were after what you don't need to say or what it doesn't need to say, and I imagine the error arose from editing one into the other. Lovely thought either way. AND in my last line, I should've written "…it doesn't…" NOT "…you doesn't…". My apologies. I guess I'm too old to stay up commenting like that XKCD comic stick figure. (1) Have you been to a Shakespeare production lately, Christopher? My experience is that good acting can still put the plays across very well indeed. Without denying the impact of 400 years, it's possible that even in the original productions not everyone in the audience was clear on petards. Reading the plays is another matter. (2) Yeah, if anything teh 'net has enriched written language and given more people a feel for the difficulties of written communication. YMMV, IMHO etc. are kinda subtle in terms of the way they negotiate an exchange, and people are learning multiple written codes. The extraordinary fact is that in a place like the US, half the population is writing frequently, whether in e-mail, facebook, twitter, texting. That's gotta mean way more everyday writing by more people than at any point in the past. (3) Thanks to Josh Bowles for putting it so well. Part of it has to be an individual's age — we reach a point when we notice the gap between our idiolects and the current pop culture. But there's also something satisfying about a generalized narrative of decline. Spectre-7, thank you for your kind validation of my comment and for catching my error. My guilty pleasure is sometimes to "post first, then proof-read". I'm back on the wagon. No worries, Janice. We're all guilty of shooting first and copy-editing later on occasion. Completely agree with Colin that good acting can bring across the play even if you don't know what the bare bodkin is that a man could make his quietus with — or indeed what that's supposed to mean, exactly. For myself I found it impossible to appreciate Shakespeare until I saw the plays on stage. When the language is flowing and accompanied by the action, it's far easier to understand than when you're reading it, where you're continuously stumbling over the archaic nature of the text. That's not to say reading and analyzing the plays should be skipped in favor of watching performances — both are valuable. But people who teach Shakespeare solely by expecting a modern reader to understand and appreciate the written plays are committing a crime, the victims being the people who decide Shakespeare is "not for them" because they can't see the meaning for the text. Shakespeare is of course for everyone. Janice, I think of that little button you push to post as the "Reveal Typos" button. Having had posts swallowed by comment software, I formed a habit of copying comments into a file I keep handy for the purpose. It has the secondary benefit of making me reread whatever I've written, before I push the Reveal Typos button. (I like that, I'm stealing it.) I still miss typos, let alone thinkos (what my son calls them) but fewer reach the eyes of other people. I like the 15-minute comment editing, though. Just remember: never use a big word when a diminutive one will suffice. "removing the @'s and #'s": Do you mean you removed all tokens that begin with those characters or just those particular characters? Because hashtags in many cases are multiple tokens concatenated into one. You have one (from Gawker) in your post: #shutupvoldemort. That's three words masquerading as one. Also, user handles will probably be longer than the average English word. User handles and hashtags like that will skew the statistics. [(myl) I did it both ways. Removing just the @'s and #'s, but retaining the hashtags, gave a mean word length of 4.80. Removing all tokens beginning with @ or # gives a mean word length of 4.68.
why "half" is not pronounced "hafe"
The pronunciation of "halfpenny" as "haypny" suggests that the vowel change responsible for "Rafe" instead of "Ralf" occurred here too, before the loss of "f" caused by cluster simplification in the compound. Hey Mark–according to one of those trackbacks up there, you say Twitter is making the English language "better." Forgive me if someone else has already challenged that assertion, but Mark Liberman didn't in his comment beneath it (probably because it was somewhat off-topic), and it's just not true. Paratactic prose is often more difficult to read than hypotactic prose, because it leaves it up to the reader to make the semantic connections between the clauses. The children's book authors of yesteryear understood this better than today's (or at least today's editors: I know one personally who understands the value of parataxis but whose editors insist — or, more typically, the weasels, claim that their stupid bosses insist — that shorter is always easier); William Steig and Lewis Carroll both wrote more highly hypotactic prose, I'll bet, than Wodehouse or Shakespeare. I'm sorry, that should have been "I know one personally who understands the value of hypotaxis…"
Before Twitter, plain old texting: in The Onion, here. The point of language in any form is communication. Being a pragmatist, I don't think the length of words is relevant if the message is clear. American English speakers always go for the shortened version of words, such as phone for telephone, net for internet, etc. We're also big on acronyms, such as AIDS or RAM, which become words in their own right. And who says compact disk when they can say CD? A high number of syllables doesn't necessarily convey more info. Likewise, using 4 (for) or U (you) only cause a problem if you insist on choking on them and being distracted from the idea. There has always been a distinction between formal and informal language, and even Shakespeare uses this in the speech of his aristocratic versus common characters. Twitter is informal. Writing a business letter is formal. I think people instinctively understand this. A living language flows and morphs to relate to our experience. The world is changing so fast that the language must follow. We need to communicate quickly and compactly to keep up. Maybe an Amazon native language doesn't change because their world remains the same. The point of language in any form is communication. Where has this been determined? Did someone make a decision to design language for this purpose? In what sense does any naturally evolving phenomenon have a "point"? Beware glibly functional, teleological explanations of language. …which, on further consideration, is pretty tangential to your actual point, with which I agree. It's nice to read logical thoughts that bring sensible perspective to issues which the mainstream only hears of when sensationalistic bull like Fiennes' assertions pops up. I first heard about this study through your interview with NPR. One point that stood out to me was when you described texting among children, teens, and adults. You mentioned that teens no longer shorten words to 'u', '4', 'wtvr' and instead now type 'you', 'for', 'whatever' etc. It was said that only a small population still text with these abbreviations and it was inferred that it is an age based gap. I am an interaction/user experience designer and would like to offer another suggestion. This is not based on age but on the demographics of phones being used. If we look at the trend of text messaging, the beginning was through feature phones where in order to type the letter C, the number 2 had to be pressed three times. This made for a very long workflow to type a simple word like 'for' (Press3-3 times for 'f', Press6-3 times for 'o', Press 7-3 times for 'r') and led to the use of simply typing '4'. As smart phones become more common, especially among teens, full keyboards are now available. It is now easy to type f-o-r on the keypad and, because numeric keys are often hidden as is the case with many touch screen devices, more difficult to navigate to the shortened numeric replacement. Carrying this thought further, many teens and young adults are embracing the smart phone market while younger children who have phones for emergencies and older adults who don't need or want the bells and whistles of smart phones are sticking with their feature phones. I would argue that age is an outcome of the type of phones people are using and it is the phone type that drives messaging-format and brevity and not age.